I first saw Agnès Varda's 1982 short documentary Ulysses several years ago, and was instantly struck by its simplicity and power. Varda revisits a haunting photograph that she had taken on a beach in Calais, France in 1954 and investigates its significance in her life and the lives of the models she had chosen. In the top left corner of the picture, a naked man stands on the shore with his back to us. At his feet sits a boy of 6 or 7, his face turned towards the camera. Balancing out the composition on the bottom right corner is the body of a goat with its eyes wide open. Varda's interviews initially yield few results. The man, Fouli Elia, now an editor at Paris Elle, coyly tells her that he remembers little or nothing of the day except his discomfort at being photographed. The boy, Ulysses Llorca, now a father of two and the owner of a Paris bookstore, also denies any concrete memories of the day. "To each his own story," he, ill at ease, tells Varda. But is this just camera fright, the hiding of some uncomfortable memory or a sincere lapse? We never find out. What we do discover is that the Llorcas were refugees from the Spanish Civil War, and Varda's neighbors. In an interview with Ulysses' mother, Bienvenida, we find out that the boy had been suffering from a rare hipbone disorder. Convalescing by the beach was prescribed, and he soon recovered. But as Bienvenida's tears show, the painful memory remains. Alongside these interviews, Varda narrates the story of her own life at the time: a successful photographer, not yet a mother, soon to be a filmmaker. Not satisfied to dwell in the realm of memoir, but feeling the need to "put things in context as I was taught at school," she asks what was "really real" on that day, May 9, 1954. And so, halfway through the film, the wider world spills into the story through a newsreel montage. It was the day after the Fête de La Victoire, France's V-Day, which was marked by the French losing the decisive battle in Indochina at Dien Bien Phu, thereby setting the stage for the eventual US involvement in Vietnam. But all was not lost; a dance marathon was in its ninth delirious day, Yves Montand was rising up the charts as Edith Piaf was in her decline, and Toto, a Neapolitan clown, was about to spearhead television's introduction in France. Not wanting to seem to castigate the audience for its imperfect memory, Varda informs us that, yes, she had to research this too. 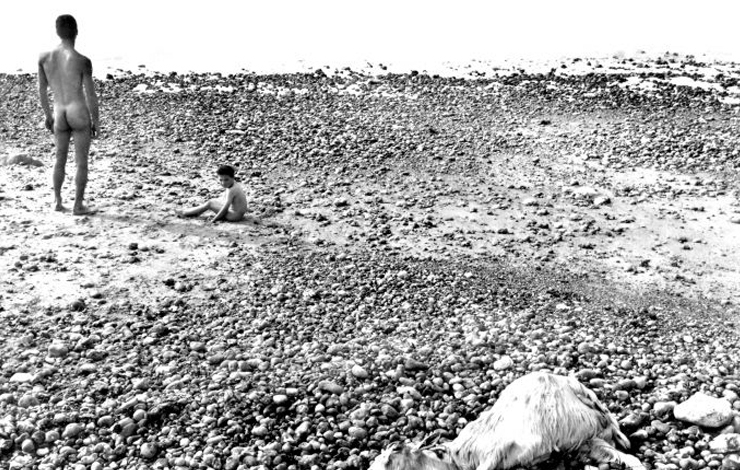 At the film's end Varda muses over the many interpretations she's given the photograph over the years: it's a scene from the Odyssey, with the child lifted from Oliver Twist or Buñuel's Los Olvidados. The photograph resists any one reading. But in her investigations, this placeholder of memory has both illuminated a moment in time in this small circle of lives and pointed to the larger world and its history. Whether I'm editing or directing, Ulysses is a lesson in clarity of intent and execution. Too often it's easy to get lost in clever, overly complicated approaches to making films, especially with today's camera and editing technology. Using the simplest of means-first-person voiceover, three interviews, still photographs and judiciously selected music and newsreel footage, Varda has created an intimate and moving essay on art, memory and storytelling. And did I mention the series of sight gags with a real live goat? Watch this film and see it for yourself. Tim Sternberg's Salim Baba (2007) was nominated for an Academy Award for Best Documentary Short Subject.